Many of us read the food and ingredient labels before we purchase them; the same thing goes with products we use on a daily basis. Many curly heads are now researching the key ingredients used in their favourite products for curly hair to ensure the products they are using are safe for their scalp and curls. Curly Hair Solutions™ products are water-based products that contain the highest quality ingredients that do not contain any silicone. Products with silicone ingredients leave a cosmetic coating on the hair and this coating prevents curly hair from absorbing natural oils from the scalp and moisture from the air. Curly hair is very porous and needs to be able to absorb moisture. However, silicones can build up and create a thicker coating every time you continue to use a product that contains silicones. Silicones are a short term solution to making the hair shiny and smooth but will eventually result in unmanageable flyaway’s and flat curly hair. To test if you have buildup in your hair, slide your fingers up and down the strands. If there is no resistance when you slide your fingers up towards the scalp, you have buildup. In order to achieve healthy, clean curly hair, use products that do not contain silicones, and this will ultimately benefit your styling process and your naturally curly hair. Magnesium is a quality ingredient that is found in a few of our Curly Hair Solutions™ products. The beauty of Magnesium is that it is able to restore and rebuild the broken salt bonds in the hair shaft after chemical processing. Salt bonds account for 35% of your hair’s internal strength. So if you color, perm or relax your hair, magnesium in your products is very important in keeping your hair strong. Panthenol, is another important ingredient found in Curly Hair Solutions products to help maintain the look and feel of all curl types. When Panthenol comes into contact with your skin or hair it turns into Vitamin B-5. Vitamin B-5, adds beautiful shine to your hair, helping it retain moisture and prevent split ends. Another “must have” ingredient in Curly Hair Solutions™ products are Silk Amino Acids. Natural silk is the strongest natural fiber in the world. The size of the molecule is so tiny that it can penetrate deeper into the hair shaft than any other protein. It will leave your curly hair feeling clean and soft, without ever adding weight. Always ensure you are getting ingredient information from a reliable source, and if you aren’t sure, ask! Ingredients play an extremely important role in the outcome of your curls, so it is beneficial to do some homework before you purchase any curly hair products. 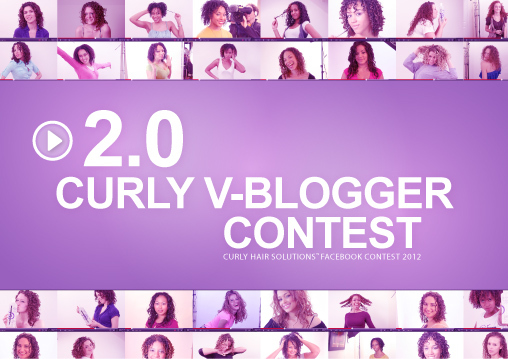 Unfortunately the Curly Hair Solutions 2.0 Curly V-Blogger Contest has been postponed to a later date. If you have any questions in regards to the cancellation of the contest, please email info@frizzoff.com. Don't forget to "Like" Curly Hair Solutions on Facebook for new contest and promotions monthly.